Companies and individuals that participate in technical standard setting can help to drive the development of technology. 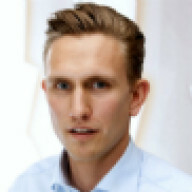 New and innovative technical solutions, such as emerging technologies associated with the Internet of Things (IoT), will rely on technical standards to facilitate communication between myriad devices and objects, which will affect all sorts of different industries beyond traditional technology and telecoms businesses, such as automotive, buildings and construction, energy metering, traffic management and medical instruments. Standard-setting organisations (SSOs) recognise that technical standards often incorporate technologies that are subject to patents owned by participants in the development of a standard. To address this issue and associated competition law concerns, SSOs often adopt patent policies which require their members to agree to license SEPs on FRAND terms. This article evaluates whether the Institute of Electrical and Electronics Engineers (IEEE) 2015 patent policy updates influenced its members and specifically their willingness to contribute technologies and make associated R&D investments, in support of the ongoing development of IEEE 802 standards. This is the third article which addresses the empirical record following the IEEE’s patent policy updates. the name and company affiliation of the authors of the contribution. Figure 1 illustrates the total number of contributions submitted to the IEEE 802 working groups since 2000. As can be seen, there has been a significant uptick in contributions to IEEE since the patent policy updates, from roughly 6,000 contributions in 2014 to almost 8,000 contributions in 2018 – an increase of about 30%. 802.11ax (first technical contributions submitted in 2015). All three standards are subject to significant numbers of declarations regarding SEPs, and the working groups have comparable sizes and a similar number of members. If technical participation and contributions to the IEEE had been negatively affected by the IEEE’s policy updates, then it could be predicted that 802.11ax would have lower contribution levels at similar stages of the technical development process. However, the data demonstrates the opposite. 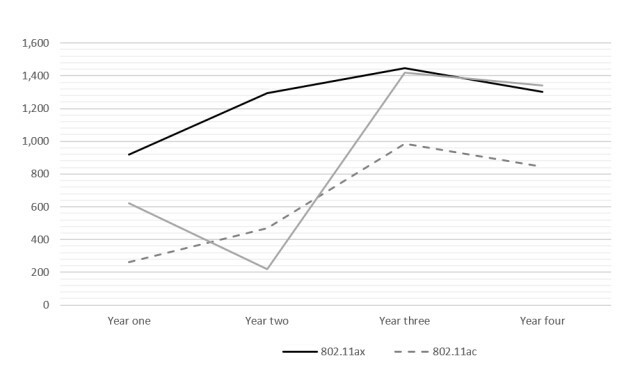 As Figure 2 illustrates, the number of standards contributions submitted after the technical process was first initiated was much higher in years one and two for 802.11ax (ie, in 2015 and 2016) than the IEEE experienced with the pre-2015 802.11ac and 802.11n projects. It was only in years three and four that technical contributions in 802.11ac and 802.11n began to equal the pace of contributions to the 802.11ax project, and the cumulative number of technical contributions to 802.11ac and 802.11n lagged well behind the contributions to 802.11ax over the first four years of the projects. In short, the empirical record regarding the 802.11ax development process does not indicate any reluctance among companies to submit their technologies to the IEEE its patent policy updates. If anything, standards participants demonstrated an even greater willingness to submit their technologies to the IEEE following the approval of its policy updates. To further test the analysis above, and to seek to exclude additional factors that could potentially account for the uptick in technical contributions to the IEEE after the enactment of the patent policy updates, it is necessary to statistically test the IEEE standards contributions data – specifically using a t-test comparison. Analysts commonly use a t-test with two samples, testing the difference between the samples. In this analysis, the average number of contributions per year and standard before and after the IEEE patent policy update for the years 2011-2014 and 2015-2018 for standards subject to SEP declarations are compared (Figure 3). On average there were 1,132 technical contributions before the patent policy update and 1,249 technical contributions after the update. 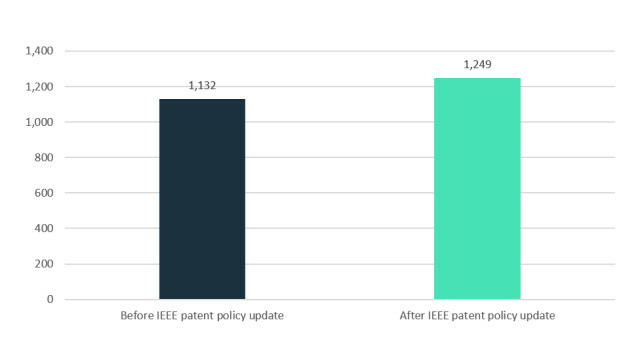 The results show no negative effect on the level of IEEE standards contributions after the patent policy update, but rather a modest positive uptick in technical contributions. Analysis of the data indicates that it is unlikely that the consistent (with a slight increase) number of technical contributions during development processes before and after the IEEE patent policy updates occurred due to mere chance. The number of technical contributions submitted in IEEE 802 working groups has continued to increase since the IEEE patent policy updates, and in 2018 was at the highest level in the history of the IEEE. The level of technical contributions submitted to leading IEEE 802.11 standard projects initiated after 2015 equals and exceeds the level of contributions submitted to leading IEEE 802.11 standard projects before 2015. The increase of technical contributions in patent-heavy IEEE 802 working groups closely matches the increase in technical contributions for IEEE 802 standards where no patent declarations were filed. This indicates that patent policy considerations have not been a significant factor for companies when deciding whether to invest in and submit technologies to IEEE 802 working groups.